Larger, reshaped exhaust port and sub-exhaust ports for increased low-to-mid rpm power and torque. Reshaped intake port plus revised scavenging port timing and shape for improved low-to-mid rpm power delivery. Narrower reed valve intake passage and matching intake pipe for increased intake velocity, improved cylinder charging and combustion. New exhaust valve linkage system provides more positive opening of the main exhaust valve for improved power delivery and throttle response at all rpm. Cam-operated sub-exhaust port valve system further enhances power delivery and rev capability from mid-to-high rpm. New domed piston with reshaped skirt for improved durability and throttle response. Larger airbox with 20% more capacity features a new front cover to block engine heat and is fed by frame cover-mounted cool air ducts for improved throttle response. Heavier magneto rotor increases crankshaft inertia for improved tractability and traction under acceleration. Smaller diameter right-side crankshaft end and oil seal reduces seal contact area and friction by 40%. New water pump impeller features improved blade shape for less mechanical loss and smaller diameter oil seal for reduced friction. 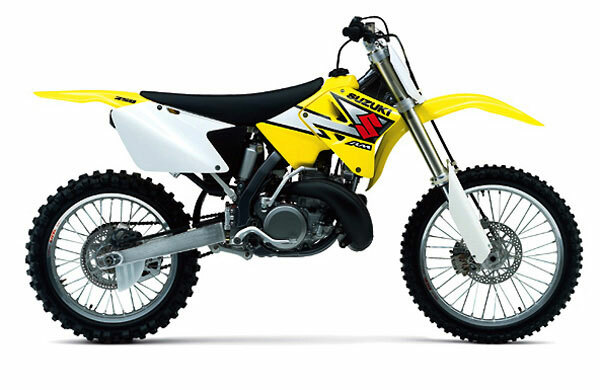 More precise shifting transmission features new output shaft with improved spline shape, new shift pawl pin with reduced side play, and more durable clutch plates with lighter springs for better clutch lever feel. Improved front fork featuring new damping piston with straighter oil flow passageways for more linear damping and new rubber bump-stop to minimize harshness at full compression. New rear shock with improved low-speed compression damping control. Wider footpegs with improved mounting position. Lighter-weight brake pedal with repositioned pivot for increased ground clearance. Modified sub-frame with round cross brace for improved flow to airbox. More durable front wheel rim with thicker material at center and edges. New front wheel spacer for easier wheel installation. New brake discs with new hole pattern to reduce noise and pad wear. New rear brake pads with improved performance and durability. Improved seat with firmer cushion and thicker, more durable cover.